The stats below show the most recent week's FanDuel performance and stats for all players. You can compare a player's most recent performance to his season averages shown in bold, and you can also compare the player's most recent performance to his previous week's stats, shown in italics. Click here to better understand how to use this tool. This specific set of data shows the FanDuel Points, Salary, and Price Per Point of all players for the most recent week’s game, along with the season averages, as well as the prior week’s stats. Fantasy footballers all have their own strategies and methodologies for researching players. Some fantasy players don’t care about season averages and only want to look at current trends, while others always like to compare recent stats to season averages to see if a player is outperforming. With this single page of data, you can do both. We don’t presume to tell how how to do your research. We just give you the FREE tools to do so! At a glance, the columns in bold show season averages, while the columns in italics show the week prior’s stats. Select the Week (the most recent week of completed games) and the Position to narrow the query. By default, the query will run for the most recent week of games completed and include ALL positions. The tool displays the player’s most recent week’s FanDuel stats, season average stats, prior week stats, upcoming opponent and the opponent’s rankings, as well as whether the next game is at HOME or AWAY. HINTS: Ranking players by their FD Price/Pt shows their fantasy values based on the most recent game, but you can also sort the data by the Next FD Price/Pt which applies the upcoming FanDuel Salary to the past week’s fantasy numbers. Many fantasy footballers look for volume. Sort the data by number of rushing attempts Rush Att, or receiving targets Rec Targerts or the sum of both RushAtt + RecTgt. All this information can help you determine which players to look at for drafting your next team. Good luck! FD Pts – FanDuel fantasy points scored from the most recent week. FD Salary – FanDuel salary from the most recent week. FD Price/Pt – FanDuel player salary price per fantasy point earned from the most recent week. Off Snap %Rush Att – Number of rushing attempts in the game. Rush Yds – Number of rushing yards. Rec Targets – Number of receiving targets. Recs – Number of completed receptions. Rec Yds – Number of receiving yards. Rush Att + Rec Tgt – The sum of rushing attempts and receiving targets this player had in the game. TDs – # of touchdowns scored in most recent game. FD Pts Avg – Season average of FanDuel fantasy points per game through the most recent week. FD Salary Avg – Season average of FanDuel salary cost per week. Prev Off Snap %Prev FD Pts – FanDuel points scored in the prior week’s game. Prev FD Salary – FanDuel salary in the prior week’s game. Prev FD Price/Pt – FanDuel player salary price per fantasy point earned from the most previous week. Prev Rush Yds – Rushing yards from the previous week. Prev Rec Yds – Receiving yards from the previous week. Prev Rush Att + Rec Tgt – The sum of rushing attempts and receiving targets this player had in the previous week’s game. Prev Total Yds – Total yards (rushing yards + receiving yards) this player had in the previous week’s game. Prev TDs – # of touchdowns scored in prior week’s game. Next Opp – The next upcoming opponent. Opp Rank – The opponents defensive ranking. Opp PosRank – The opponents defensive rank vs. the position. Next Game – Shows weather the upcoming game for that player is a HOME game or AWAY game. 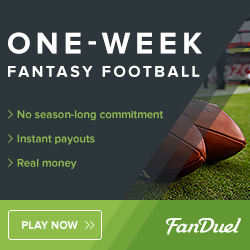 Next FD Salary – Player’s FanDuel salary for the upcoming week. Next FD Price/Pt – Player’s FanDuel salary for the upcoming week divided by the FanDuel fantasy points earned from this past week. Don't Have an Account to FanDuel? Start drafting teams, discuss strategies, and win money! What are you waiting for? Click here! If you have any feedback or suggestions on creating new queries, please contact us via our Contact Form!